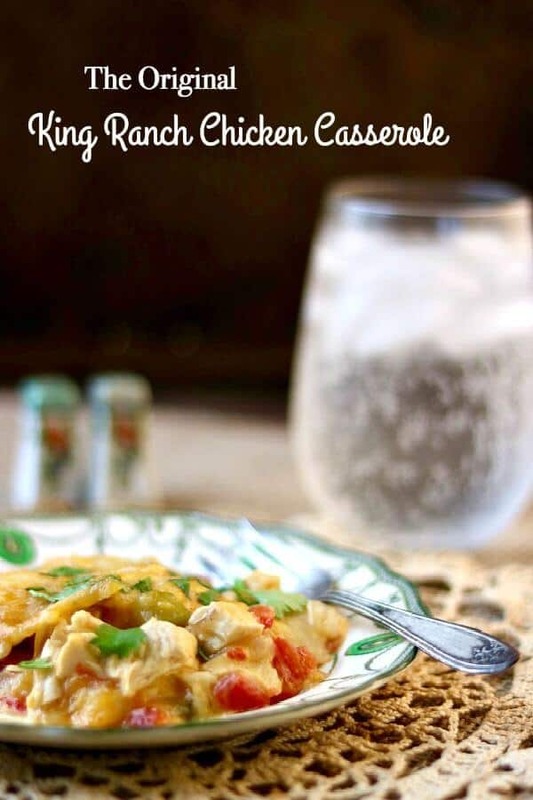 There are a lot of versions of the classic King Ranch chicken casserole recipe but the original is quick, easy, and has stood the test of time. 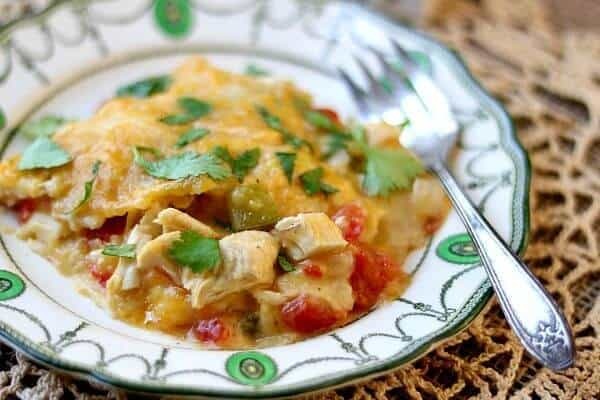 Chicken, tomatoes with chiles, and onion are mixed with a creamy, rich sauce and layered in a casserole dish with corn tortillas and a generous amount of cheese. This casserole freezes well, travels well, and disappears fast – you can’t really ask for more than that. So I normally steer clear of canned, condensed soups and y’all know it. Normally any recipe is better with homemade sauce. I do make this King Ranch chicken with a homemade sauce and a few substitutions from time to time but, to be perfectly honest, my family eats the original version better than anything else I’ve come up with. Either I’ve failed as a food blogger mom OR the original version is just that yummy. You can decide for yourself. I originally posted this recipe in 2008 but when I was searching through the blog posts I couldn’t find it anywhere. I have no idea what happened to it but I thought I’d better add it back on the blog. This is a 1950s Junior League kind of recipe. I don’t think anyone knows where it got started but it’s a classic type of mid-century casserole. Definitely the kind I grew up on. You have to kind of miss those days when it was fine to eat a ton of sodium and fat. No one ever looked down on my mom because she made a casserole with ingredients out of a can. 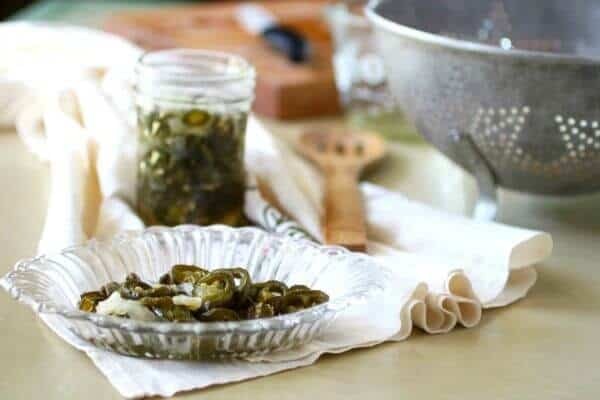 Cooking in the 1950s and 60s was a quick and easy kind of thing. As a food writer I feel like I have a certain responsibility to inspire y’all to make amazing food with fresh ingredients. I’d be a liar if I said that I never used convenience foods. Even boxed mac and cheese sometimes, y’all – oh the horror! Social media has created a generation of women who constantly feel judged for how they parent, how they clean their homes, how they dress, and how they cook. That’s not even an extensive list of things we are judged on. When you are a food writer you add several categories to that list. Most food bloggers have a tough time admitted that sometimes the recipes are puke-worthy rather than drool-worthy. Sometimes I glance furtively around at the grocery store hoping that no one who “knows” me sees me buying corn dogs. I’ve considered wearing a trench coat and pair of the fake glasses with the nose and moustache (mustache, moustache – both correct) on shopping days. My kids eat sugary cereals and pop tarts. All but one prefers boxes mac and cheese to homemade AND they’d rather eat at Whataburger than one of my gourmet meals. I used to fight it but I finally realized that I don’t have to impress anyone with my clean eating habits, my cooking skills, or my menu. Somedays I have client work that keeps me so busy that I’m thrilled for them to be able to microwave a couple of corn dogs and open a can of green beans. That, my friends, is reality. The images that I put on the blog are carefully arranged to look fantastic – or as fantastic as I can make it look. The food I put in front of my family rarely gets plated like that. Like you, we’re a busy group of people and I’m tired of trying to be Pinterest perfect. I am saying this to say that I hope when you read Restless Chipotle (and Lowcarb-ology) that you don’t feel like the recipes are something you have to live up to. I hope that you see them as every day comfort food that fits your lifestyle. I hope you are comfortable substituting canned soup for a sauce when you just don’t have time to make it from scratch. And I hope you never feel diminished because of it. Casseroles like this King Ranch chicken are a life saver for busy people. I like to make a double batch and freeze one for those times when my life is spinning out of control OR someone from church needs dinner. You can freeze this for up to 6 months with no problem and, full disclosure, I once found one in the freezer that was over a year old and it tasted fine. Please don’t tell anyone – I’m still struggling with the Pinterest Perfect Persona. I am of the opinion that pretty things make life more livable. I *could* make this King Ranch Chicken in any old oven proof container but making it in a pretty casserole dish just gives me joy. A casserole carrier is a great way to take your casserole on the road when your heading to a pot luck or taking someone a meal. 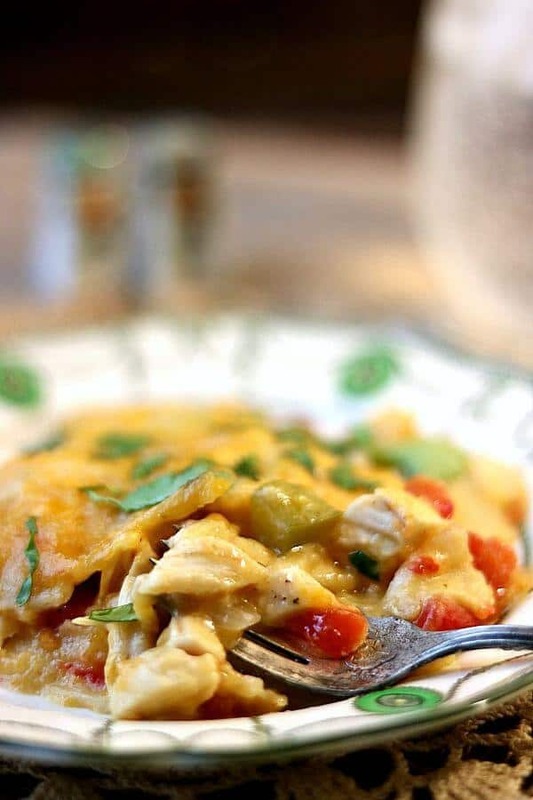 Classic King Ranch Chicken Casserole recipe is super quick and easy. Chicken, Ro*Tel, and onion are mixed with a creamy sauce and layered with corn tortillas and cheese. It's a family favorite. Grease or spray 13x9-inch baking dish with cooking spray and set aside. Add diced bell pepper and onion. Cook, stirring often, about 5 minutes or until tender. Stir in both soups, undrained tomatoes with chiles, and chicken. Add about 1/2 of the tortillas to the bottom of the baking dish. Bake covered for 20 minutes then remove the cover and bake 20 minutes more. Freezes well for up to 6 months. May make ahead and hold in the refrigerator for up to 2 days. If you haven’t tried using flour tortillas, you should! That’s how my mom always made this dish! She also served it topped with sour cream, cilantro, and freshly diced and seeded tomatoes- it was my favorite childhood meal! Just discovered your blog and I love it! I’m saving recipes left and right! This King Ranch Casserole looks delicious! I’ve always intended to make it, but never did. Thanks for posting. I may make this for our family gathering this weekend!